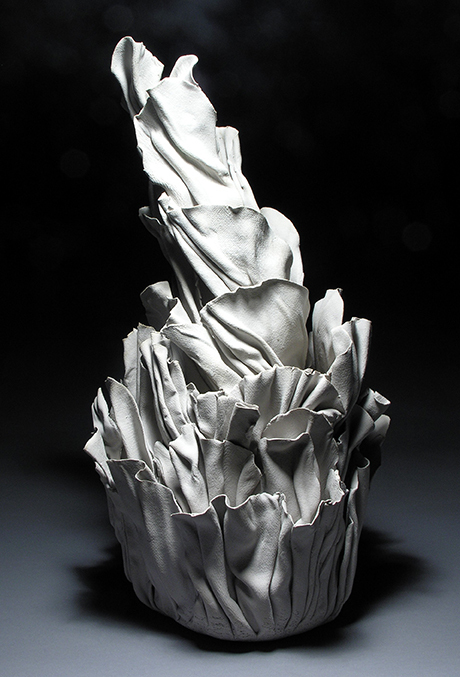 Liz Lescault is an accomplished ceramic artist known both for her vessel forms and her biomorphic sculptures. Her lauded solo exhibition “Embers” in June of 2011 marked a transition from organic vessel forms to biomorphic sculpture. Lescault has had numerous solo and collaborative exhibitions and received numerous awards including the 2013 Maryland State Individual Artist’s Award. In 2015 she was selected by Kristi-Anne Caisse, Assistant Director of the American University Museum at the Katzen Arts Center in Washington, DC, to be one of four center-piece sculptors in SELECT 2015 the WPA’s 34th Art Auction Exhibition and Gala. In 2012 Lescault was selected by curator Sarah Tanguy to show a retrospective selection of her work in “Siting Presence” at The American Center for Physics, College Park, Md. She was also selected in 2012 as a featured Artist for “Like.Comment.Share” at American University Art Museum, Katzen Art Center, Washington DC. In conjunction with her 2011 Solo Exhibition, “Xenophilia” at Harmony Hall Regional Center in Fort Washington, MD, she produced Xenophilia Interpretations” a multi-media/cross discipline improvisational performances and artist talks. Liz has lived in Botswana and Lesotho where she studied traditional African ceramic techniques, and in France where she studied watercolor. A selection of her work is part of the permanent collection of the National Museum of Botswana. My sculpture reflects my fascination with the natural world in all its forms. I draw my inspiration from elemental forms found in nature. My biomorphic sculptures freely combine and reimagine ontological elements from nature, using imagery from the ocean depths, the detritus of the forest floor, geologic formations and microscopic life. The intent is to create work that can be simultaneously sensual and scientific, beautiful and ominous, daring the viewer to recognize where the inspiration originated. My art is improvisational. I begin with the seed of an idea and a basic form and then let the work evolve spontaneously. The making is mysterious, even to me, and much of what happens when I am working arises from the subconscious. My primary medium is clay often combined with other media although I am currently creating a series of mixed media installations with found objects and recycled materials as freely standing floor pieces.